In lesson two, the student is introduced to concepts of compositional study, how to change and adjust drawings, how to decide where to start, and drawing overlapping objects. The author wants you to go over the drawing tips with your students. The tips begin on page 83* and include everything up to The Lesson. The tips end on page 92. The tips are used in the lesson. Overlapping, page 85, is an exercise. The exercise is illustrated on page 86. Changing and adjusting a drawing is explained beginning on page 85. Should the students express certain dissatisfactions in their drawings, the instructor can show them that they can fix what they do not like (called "Oops!" in the book on pages 87 and 89) and trace parts of their drawing onto another sheet of paper for the reasons shown on page 89. The author feels that this information is important for the student to know, so place Adjustments and Changes on your art schedule. "The section on adjustments and changes is very important. It is designed to help you let go of your fears about making a mistake and gain knowledge of changing things as you go along." 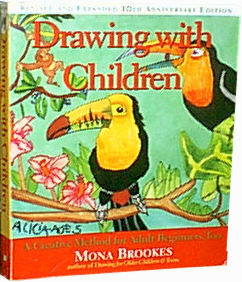 Where to Start, page 90, has suggestions to teach your students about where to start a drawing. Those who draw know that the closest object is typically drawn first, but this is more of a compositional thinking process than putting the pencil to paper and drawing without thinking about where the parts of the drawing will go on the piece of paper. There are two things to consider, 1. the location of the subject on the paper and 2. what part of the subject to draw first. Of course, I may be way off base and this may not be what the author is saying at all. Nevertheless, Where to Start leads to Preliminary Sketches. Regarding where to start, there is a tip in the last part of the paragraph with the heading: Beginning on page 95. As your student works on preliminary sketches and learns to fill the paper with his drawing, he will be exploring the principles of art that involve balance and proportion. The mechanics of composition are explored in preliminary sketches. The students are led to purposefully draw the subject(s) on the paper in a setting. The setting is inspired from materials that you have gathered for them and from their imagination. A goal in making the sketches is to scale the subjects so that the students learn how to use the whole sheet of paper. A preliminary sketch exercise is explained on page 91, and introduced on page 90 beginning with "Projecting the image on the paper" and illustrated in figure 2.14 on page 96. Artists do this sort of thing, the preliminary sketches are sometimes called compositional studies. Compositional studies are often combined with the exercises mentioned on pages 91 and 92. I believe that compositional study is important for students to put into practice. Depending on how you go about conducting the class, this lesson might fulfill most of the art standards for grades 1-3. The additional visual arts needed fall into the technical media1 category. If your students made collages in Lesson One, then you've already done something in the technical media category. To read more about visual arts standards, see Homeschool Art Topics by Grade. Beginning on page 93, the author provides a lesson for each of the three levels. For additional lessons, she has provided a general outline on page 114. The topic of composition in chapter 2 is important and I recommend using the outline on page 114 and doing more lessons. To prepare, be on the lookout for graphics that you believe will inspire your children to draw. Use illustrated books such as Golden Books and other children's books as a source for graphics that your children might like. I have linked Draw · Write · Now books in the right column because, in the books, subjects are broken down into steps similar to the technique that your child learns in Drawing with Children. Each book has a theme, and if you chose just one, choose a theme that fascinates your child. * Page numbers are based on the book published in 1996. The image of the book is a scanned image of my copy of the book. Three cursive handwriting warm-up printable files, each one has two sections. They are not meant to "go with" any particular cursive style, they are just warm-ups. The warm-ups are also linked at Cursive and Cursive Z.